It has been awhile since I tried out a full regimen from ONE brand. I was so generously gifted these products from a sweet co-worker who knew that I loved trying out new skincare. *Just wanted to let you know even though these have been gifted, I will always write an honest review. I have been intrigued by the skincare ingredient Niacin ever since I tried out The Ordinary's Niacinamide 10% and Zinc 1% earlier this year. Nia24 is a skincare line which uses a patented Niacin molecule called Pro-Niacin. Pro-Niacin helps deliver Niacin deep into the skin to stimulated DNA repair and build the skin barrier from the inside out. Niacin, also called B3, is water-soluble and found in food like mushrooms, tuna fish, and meat. Niacin is known to boost water content in the skin, help reduce rosacea, and treat acne. Niacinamide, one of the three forms of Niacin (B3), when applied topically can reduce fine lines and wrinkles and other skin issues concerned with elasticity and anti-aging. Now let's get into the fun stuff, the products! After cleansing my skin, I apply one to two pumps of this all over my face and neck. The consistency is very fluid and water-like and absorbs quickly. This is by far my favorite product so far because of how effortless it is to use. I love that I can apply something so lightweight but get a major drench of hydration. Further looking into the technology of the product, I learned it has three different delivery systems of Hyaluronic acid; hydrolyzed, encapsulated, and slow-release. With that you get instant hydration and plump looking skin while also getting long-lasting hydration over time. After applying the Intensive Moisture Serum, I apply just a pea-sized (see above photo) all over my face and neck. This is a bit thicker in texture so I would recommend applying over your existing serum or essence. For dryer areas on my skin, this works great. Let me say that a little goes a long way. I have applied too much of this and it does ball up on your skin, which is a major annoyance if you wear makeup. This has a similar light fresh scent like the rest of the products and I truly enjoy it. In addition to Pro-Niacin, this product contains vitamin A to improve elasticity, antioxidants to fight free radicals, ceramides to ensure moisture retention and a peptide complex to combat on those deep wrinkles and expression lines. I apply half of a pea-sized to each of my eye by staring on the outer corner and working my way under and over my eyelid. I like to use eye creams along the orbital bone instead of just under the eye. I use this just at night because it does not contain SPF. I believe that applying an eye cream with an SPF during the day is essential. This eye cream is beautiful in texture. It reminds me a lot of Bobbi Browns Extra Eye Repair. I love how rich it is and how instantly it brightens with caffeine, vitamin C, licorice and white birch. I have noticed a decrease in puffiness since using this eye cream. I also don't have any dryness on the outer edges of my eyes which is common for me. Keeping your eye area hydrated is very important in your skincare routine to prevent signs of aging. I apply a very small amount of this to the drier points of my face in addition to my neck and décolleté my last step before bed. This product is very heavy, so be careful not to apply too much. This moisturizer is as it says 'intense'. I personally do not have very dry skin so I believe this product is not necessarily for me. I do like to use a heavier moisturizer on my neck and décolleté so I will continue using it there. However, it might just be too much for my face every night. If you have dry skin, you would probably love this. 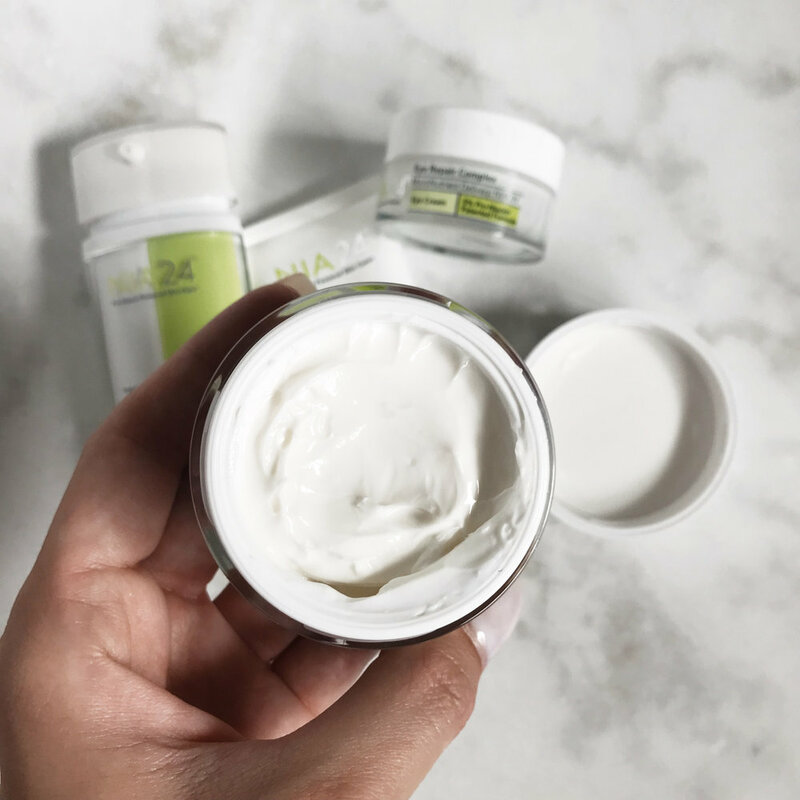 Have you tried any NIA24 products? What are your thoughts on Niacinamide?